The inflow of Chinese and Turkish steel imports into the UAE, at prices below an acceptable market value negatively impact production volumes and profitability of UAE steel players, said Al Romaithi, adding such imports would damage both existing and future steel expansion and investment projects. 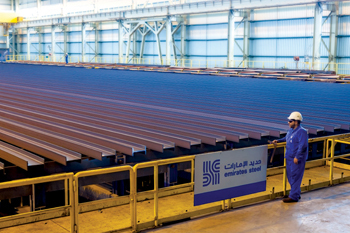 According to Emirates Steel, the largest integrated steel maker in the UAE, Chinese exports to the country grew 63 per cent in 2014 compared with 2013. A similar increase was estimated for exports to the GCC and the wider Arab region. Imports of Chinese billets into the UAE rose 300 per cent in 2014 against 2013 while Chinese wire rod imports surged nearly 112 per cent in the same period. And in January this year, Chinese exports to the UAE increased by 186 per cent compared to January 2014. Turkish rebar exports to the UAE grew 28 per cent to 1.33 million tonnes in 2014 compared with 2013. Rebar arrivals in the UAE climbed 88 per cent in January 2015 compared to January 2014. Al Romaithi said a lack of customs protection in the UAE would lead to an escalation of the problem. “If proper measures are not adopted, many producers in the UAE would be at risk of losing capacity, putting the country at risk of losing impetus in diversifying its economy away from dependence on oil as a major source of income,” he noted. As well as levying anti-dumping duties, Al Romaithi recommended that a uniform standard should be introduced to fend off low-quality Chinese imports and force Chinese exporters of steel into the UAE to comply. Practices such as the ASTM (American Standards for Testing of Materials) and BS (British Standards) are applied in the US and Europe, he said. A surge in Chinese exports this year has led to anti-dumping investigations being initiated in the US, Turkey, Southeast Asia, Europe and other main destinations for shipments from China. Al Romaithi said the UAE should do what other countries were doing aggressively in a similar situation: revise import tariffs or increase duty levels to avoid the threat of cheap imports. He cited the 110 per cent antidumping duty imposed by the US on Chinese wire rod imports and the move by Turkey to raise its import duties to 30-40 per cent. Some European countries also imposed 13-45 per cent customs protection duty on Chinese flat steel products.